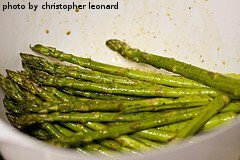 Green Aparagus is probably the most common asparagus category in the United States. The spears range from very thin to very thick. A common green variety is the Jersey King, which we grow in our own garden. It has medium diameter spears that average around 7-8 inches long. We like the flavor of this variety, along with how productive it is. Another variety is the Jersey Knight, which boasts long, thin spears reaching 8-10 inches. The Jersey Giant variety features shorter spears that are very thick in diameter. Mary Washington is also a popular variety, featuring medium-sized spears. It is known to be fast growing and high yielding. Precoce D'Argenteuil is a rarer Italian variety that features thin stalks and rose-colored buds. To our knowledge, this variety is only available in the USA from seed. White Asparagus is the asparagus category most preferred in Europe. The spears are deprived of light by keeping dirt mounded around the plant. Without light, the plants cannot produce chlorophyll, and therefore remain white in color. 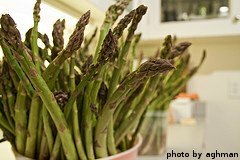 Any variety of asparagus will produce white spears, as long as it is not exposed to light. Purple Asparagus is the category that is most commonly found in England and Italy. Purple asparagus produces thick, purple spears that are generally sweeter and more tender than varieties of green asparagus. However, the plants produce less numbers of spears. Purple Passion is the most common variety. Purple asparagus spears usually lose their color when cooked for very long. Some people prefer to eat purple asparagus raw or in salads so that it retains its unique color. Some people grow several different varieties of asparagus, either intentionally, or because they've added different crowns to their asparagus patch over the years. Either way, different varieties can be used to please the eye and the palate. In addition, different varieties will mature at different times. So, if you really love asparagus, you can keep a continuous supply coming during the harvest period by planting a couple of different varieties.